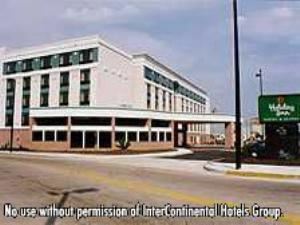 The Holiday Inn Hotel and Suites HuntingtonWest Virginia. New property All amenities are complimentary 100 rooms equipped with computers and high speed wireless internet All rooms:microwave, refrigerator, iron/board, coffee maker, hairdryer, customized voice mail and dataport- Full service restaurant and room service- hours for restaurant 6:30 am to 10 am- closed for lunch-Dinner 5pm to 9pm 2 state of the art fitness facilitiesIndoor pool Fully equipped business center Guest laundry facilities. Hotel is within walking distance of downtown dining and shopping. Hotel is a 12 minute drive from Tri-State airport- hotel offers complimentary airport shuttle with advance reservation. Located next the Huntington Civic Arena. One mile from Marshall University.